Having never been to Canoe Brewpub before but trying their beer at the odd cask festival I made sure to stop in for lunch and a pint of beer. Located right on the water they have a great big patio that looked like a great place to have a pint or two in the Summer. Seeing as I was going to be outdoors all day I decided to eat my lunch indoors so I headed to the bar area. A really neat feature with the bar is that above the bar they have tanks that are holding the beer being poured in the pub. I have never seen this done before. The burger was really good and the dip for fries was more of a tomato jam then ketchup. I tried their latest seasonal which was a hopped Mexican Style Lager and was pretty impressed with it. Once I finished up my lunch I got a chance to check out the brewery. I now know why you can’t find Canoe beer anywhere. This brewery is amazingly small and cramped. It almost seems like it was an afterthought as the brewpub side and restaurant are huge. The area was so cramped I was not able to get very good photos of the brewery. Everything was just to close together. Two of these photos were taken through a glass window in a door and then the rest are from inside the brewery. It would be well worth checking out Canoe next time you are in Victoria! I know that I will be back. 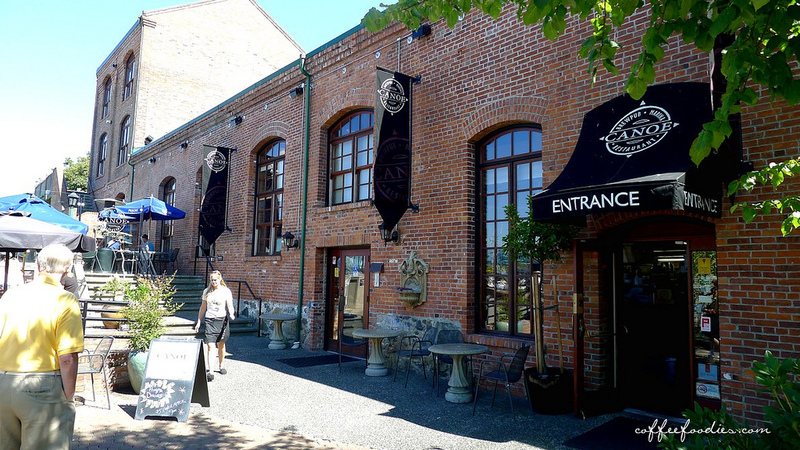 This entry was posted in Brew Pub and tagged bc, beer, brewery, brewpub, canada, craft beer, food, huge patio, patio, victoria, victoria harbour. Yeah I knew that Sean came from there. Awesome burgers. Did you get a chance to stop by the Moon Under Water? No not this time but I have been a few times and have had lots of their beer.